Khalifa International Stadium ... painted with eco-friendly Durasol. 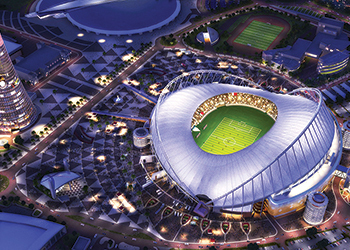 First built first in 1976 in Al Rayyan, the stadium will be a venue for the 2022 Fifa World Cup matches. The renovation programme has focused on the preservation of its long-standing history as well as providing a versatile, contemporary and sustainable facility. Working closely with design consultant Dar Al Handasah, Jotun was appointed to supply powder coatings for the curtain walls of the stadium, which was renovated using aluminium extrusions to strengthen its core structure. There are many advantages of using aluminium extrusions to build a curtain-wall including that it allows for filtration of natural light, prevents air and moisture from entering the structure and stops the spread of fire from floor to floor – which has become a fairly common occurrence in this part of the world lately. However, it is equally important to protect these aluminium extrusions from harsh climatic conditions in the region, as Monesh Aidasani, the regional specifications manager - Middle East, India and Africa (MEIA) at Jotun Powder Coatings, points out. Since curtain-walls are a non-structural component, it is important to protect the building from environmental factors such as wind and seismic forces. And since Qatar is susceptible to high temperatures, particularly in the summer months, durability is crucial to the restoration process to ensure the stadium is well-equipped to handle the climatic conditions of the Middle East, which put severe strain on exterior coatings. “Offering superior durability and timeless protection, Jotun Durasol was selected for its ability to withstand the intensity of ultraviolet (UV) light, soaring temperatures, various levels of humidity, dirt pick-up and other environmental challenges,” says Aidasani. The coating offers high resistance to abrasion and scratches, making it particularly suitable for public areas such as the Khalifa International Stadium. Additionally, it also protects against damage during mounting, handling and transportation. Another important factor that was taken into consideration while refurbishing the stadium was its appearance, says Aidasani. Primarily, he says, powder coatings are known for their sustainability as the strictly controlled factory process ensures that virtually no VOCs (volatile organic compounds) are released in the process compared to traditional liquid paints. The unused or over-sprayed powder can also be recycled with minimal wastage, and disposal is easy and safe. “In addition, the easy single-coat application makes Jotun Durasol an ideal solution for areas with high traffic and air pollution. This economical and sustainable alternative to PVDF (polyvinylidene difluoride) liquid systems is certified according to Qualicoat Class 3 standard and has weathering performance in line with AAMA 2605, ensuring it meets the highest attainable level of weathering resistance,” adds Aidasani. Another challenge Jotun had to face was to match the colours that had been applied to the existing stadium over 40 years ago. “The Jotun Durasol range comes in 35 timeless shades. However, to meet the needs of this refurbishment project, customisation was adopted using several colours to get the exact shade of the stadium,” says Aidasani. Furthermore, he says, the restoration of the Khalifa International Stadium is directed towards building and maintaining sustainable standards that Qatar and the wider region is currently focused on. Jotun has adopted the strictest of guidelines to ensure the application process on the stadium meets these standards, Aidasani adds. “It is the stadium’s commitment to achieve sustainability that earned it the provisional four-star rating in the Global Sustainability Assessment System (GSAS), which is administered by the Gulf Organisation for Research and Development (Gord). This is the first time that the Gord has issued a certificate for a renovation project. “Today, Jotun Durasol is the most durable powder coating solution available in the market as it has the ability to keep maintenance costs to a minimum while also safeguarding the environment. The stadium, which has been coated by Jotun Durasol, is currently setting the benchmark for other such facilities to follow,” concludes Aidasani.